Have you heard about the new secret weapon to help improve the appearance fine lines, wrinkles, dark spots, uneven skin tone and aging skin? Let me tell you all about it! 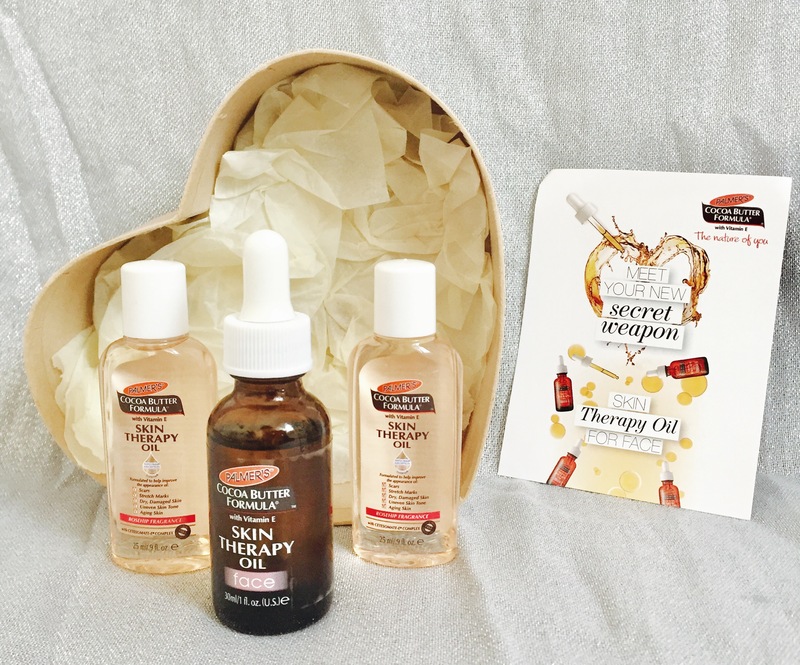 Palmer’s latest launch is the Skin Therapy Oil for Face, and as their brand ambassador, I have been testing it out to see how it works and share with you all my experience of using it so far. First let me begin by telling you what this product is all about. This pure oil blend contains ten natural oils, yes you read that right, TEN! These ten oils are Sesame Oil, Coconut Oil, Sweet Almond Oil, Macadamia Nut Oil, Apricot Oil, Argan Oil, Grapeseed Oil, Rosehip Oil, Camelina Oil and Sunflower Oil. This 30 ml bottle also contains the powerful anti-aging ingredient to smoothen skin texture, Retinol, and Vitamin C which is a natural antioxidant that helps brighten skin and dark spots. As expected, this therapy oil also contains the signature ingredient of Palmer’s for deep moisturising- pure cocoa butter. The great thing, as with all Palmer’s products, though is of course the fact that the skin therapy oil is Hypoallergenic, Paraben Free, Phthalate Free and Dermatologist Tested. In simpler words for you and me, very unlikely to have a reaction to, free of nasties and tested to be safe for use! Well, upon first sight, I instantly loved the packaging. The skin therapy oil is packaged in a glass bottle and is applied with a dropper, which instantly gives it a luxurious feel. (It also means I have to be extra careful when using this along with my skincare routine whilst Baby Z roams freely around me!) The dropper means you can control just how much product you are putting on, and let me tell you with this oil formula, a little goes a very long way. The rosehip fragrance is rather strong upon first application, but fades with time. I was quite expecting the smell of cocoa butter to be honest, but the rosehip is a pleasant surprise, though not too floral. As I mentioned, only a couple of drops are needed so I can imagine this bottle will last me a long time. I have been using it religiously twice a day for a while, once after the shower in the mornings if I am not going out for the day, and once before bedtime. It is encouraged to be massaged into the face and neck area, so definitely find a time when your kids are well looked after to give yourself a mini pampering session. My dry skin soaks up the skin therapy oil pretty quickly as I massage it on to my face and neck in sweeping upward motions. The oil does not feel heavy at all, only a tad greasy as you would expect from an oil anyway, yet my skin drinks it up rather quickly. I did in fact have a huge breakout (urgh!) just before I started applying this skin therapy oil, which then quickly faded away, and I even had a lovely compliment about how clear my skin was looking at a recent event. Was it the magic of the Skin Therapy Oil? Perhaps. As with all skin care products, it is recommended to use them for at least a month to reap the benefits, and so I will definitely carry on using this oil to see what more it can do for the appearance of my face and neck. The best part about this oil is that it will only cost you AED 32 for a 30 ml bottle, which is quite shocking to say the least! At such an affordable price, and a great blend of oils with huge benefits, I am pretty sure this is set to be the hottest product by Palmer’s! To find out more about what Palmer’s have on offer, simply head on over to their website. For regular updates, you can also find them on Facebook, Instagram, Twitter and Youtube. 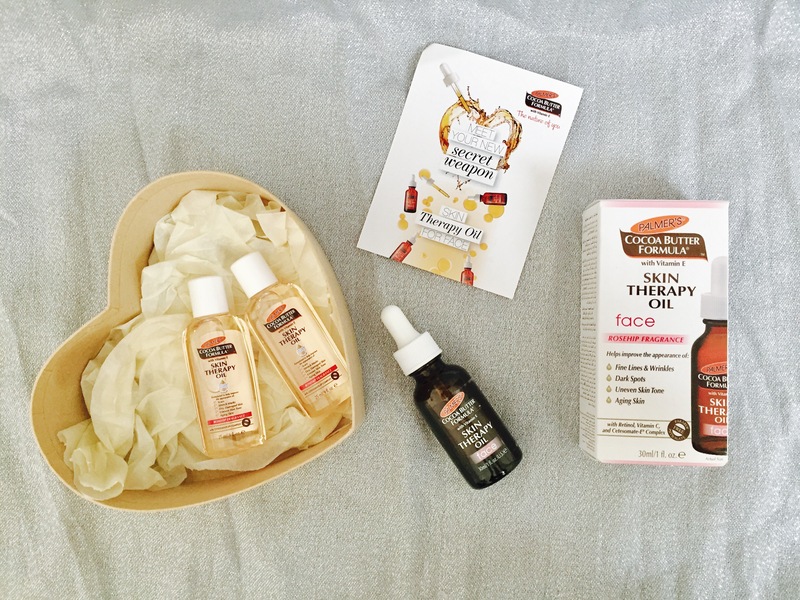 Have you tried any Palmer’s products, and what are your thoughts or recommendations? Feel free to share your thoughts in the comments section below. Thanks! Note: I received this product by Palmer’s to be reviewed. However, all views and opinions are honest and solely my own.